Birdwatchers have been flocking to a reservoir in Berkshire to catch a glimpse of a rare American bird which has accidentally migrated to the UK. 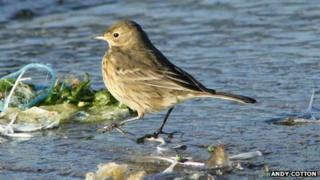 Almost one thousand people have travelled to Queen Mother Reservoir to see the American Buff-Bellied Pipit. Less than 20 of the species - which normally migrate from North to South America for the winter - have ever been spotted in the UK. Ornithologist Paul Stancliffe called it a "tremendous specimen". What birds can you expect to see in Britain? Mr Stancliffe, who is from the British Trust for Ornithology, added: "It's incredibly rare. In birding terms it's 'mega', and that doesn't mean literally - it's the size of a robin - but in terms of its presence. "It's phenomenal and you forget it's crossed the Atlantic, and breeds in North America, but this small bird has survived that crossing and found somewhere to its liking. "It's been caught up in one of the pulsing transatlantic storms and probably arrived here in a couple of days." Mr Stancliffe described it as "buff-coloured and streaky with little white eye-rings and black legs". Birdwatcher Andy Cotton said he was amazed at how close the bird came to inquisitive birdwatchers when he viewed it on Monday. He added: "It just fed along the shore of the reservoir, completely ignoring the massed birdwatchers and photographers only a few metres away." Another witness, David Hatton, said: "With a backdrop of Windsor Castle, Queen Mother Reservoir experienced scenes appropriately reminiscent of a medieval siege as a small army of birdwatchers invaded the embankments." It was first spotted by birdwatcher Michael McKee on 13 December. Renton Righelato, from Berkshire Ornithological Club, called it a "birder's bird". "Its difficult to identify, and to the untrained eye it looks like the European pipits, until you see its shiny ebony black legs," he said. The club is under licence from Thames Water to arrange birdwatching visits at the reservoir. According to the US Geological Survey, the American Buff-Bellied Pipit is 5.5in (14cm) in length and is usually found in flocks in ploughed fields, shores and tundra.